Stand-out stats for this season. 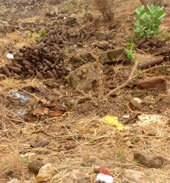 TDI destroyed 68% of all UXO destroyed in South Sudan. (Source: INSMA Report). Special mention must be made of the Khor William site where one of the teams cleared 80 tonnes of scrap metal interspersed with sub munitions and other UXO. The area is densely populated and TDI worked extremely hard to make the area safe for children. Some sites were closed down due to early rain and the project stood down for the rainy season at the end of June.